Iranian President Mahmoud Ahmadinejad has met delegates at a conference in Iran questioning the Holocaust, drawing widespread international criticism. German Chancellor Angela Merkel condemned it and British PM Tony Blair called it "shocking beyond belief". 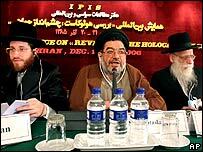 Iran says it wants to debate what it calls taboos surrounding the Holocaust. Conference participants include white supremacists and Holocaust deniers. Some six million Jews were murdered by the Nazi regime during World War II. The BBC's Frances Harrison in Tehran describes the conference as a roll call of the world's most infamous Holocaust deniers - all delighted that Iran has given them the oxygen of publicity. In a number of European countries - including Germany, Austria and France - it is illegal to deny the Holocaust. 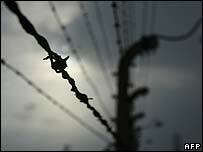 An Austrian court jailed Briton David Irving for three years on charges of Holocaust denial. At his monthly media briefing in London, UK Prime Minister Tony Blair called the Holocaust conference "shocking beyond belief". He described Iran as a "major strategic threat" to the Middle East, saying: "Iran is deliberately causing maximum problems for moderate governments and for ourselves in the region - in Palestine, in Lebanon and in Iraq." He added there was "little point" in including Iran and Syria in regional issues, such as Iraq, "unless they are prepared to be constructive" and that it would be a "major challenge" to deal with Iran. German Chancellor Angela Merkel, flanked by visiting Israeli Prime Minister Ehud Olmert, said: "We reject in the strongest terms conferences held in Iran on the supposed non-existence of the Holocaust. "Germany will never accept this and will use all possibilities at its disposal to oppose it." Mr Olmert said the conference showed the "unacceptable character" of the Iranian government and the "danger" it poses for the West. Opening the conference on Monday, Iranian Foreign Minister Manouchehr Mottaki said the aim of the conference was "not to deny or confirm the Holocaust". Mr Ahmadinejad accuses Israel of trading off a "Holocaust myth"
Mr Ahmadinejad has repeatedly downplayed the extent of the Holocaust, describing it as a myth used to justify the existence of Israel and oppression of the Palestinians. He has called for an end to the Israeli state. Many Iranians must be wondering why they have the right to deny the Holocaust with impunity, but not to question their own leaders without risking jail, our correspondent says. In recent months, newspapers have been closed, journalists jailed and students penalised for engaging in any sort of political activity in Iran.